Barker Heating & Air Conditioning is proud to serve the Dayton community! Please call us today at 937-254-0315 to consult with our home comfort specialist. Dayton, Ohio is the sixth largest city in the state, and it is the county seat of Montgomery County. As of 2010, the total population was approximately 141,500 residents. Dayton is home to ten historic neighborhoods, including Oregon District, Webster Station, and St. Anne’s Hill, and they feature mansions and single homes of Neoclassical, Tudor Revival, English Gothic, and other interesting architecture. The economy of Dayton is quite diverse, with some of the largest employers including Premier Health Partners, Montgomery County, and Grandview Medical Center. 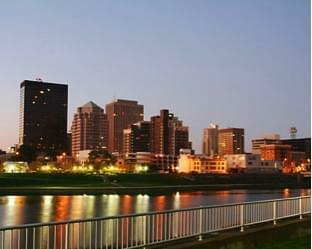 Dayton is the home of two major universities: the University of Dayton and Wright State University. Additionally, Sinclair Community College is found in this city, and this is the largest community college in the state found at a single location. Dayton is a major cultural center for the region, so there are numerous attractions located here. The Benjamin and Marian Schuster Performing Arts Center is located here, as is the historic Victoria Theatre. Tourism is popular in this city, and many visitors enjoy trips to the National Museum of the United States Air Force and the Boonshoft Museum of Discovery. Other notable attractions in the area include the Five Rivers Metro Parks, the annual Vectren Dayton Air Show, and the Dayton Art Institute. The weather of Dayton can be classified as either humid subtropical or humid continental climate zones. Summers are hot and muggy with average high temperatures in July reaching about 84 degrees. However, temperatures that exceed 90 are entirely possible, and with the high humidity in the area, it will feel even warmer. For this reason, residents are wise to invest in central air conditioning units to stay cool. Winters in Dayton tend to be cold and dry, with moderate snowfall only accumulating to less than two feet per season. However, blizzards and other severe weather conditions are possible, and since overnight lows fall well below the freezing point, dangerous conditions can result. A home furnace system or heat pump is crucial to keep interior temperatures warm while preventing pipes from freezing.